Forgiveness is a powerful key to the Kingdom. It doesn’t matter if we are the ones who have sinned or the ones who have been sinned against. Forgiveness is the key or keys to freedom and release. 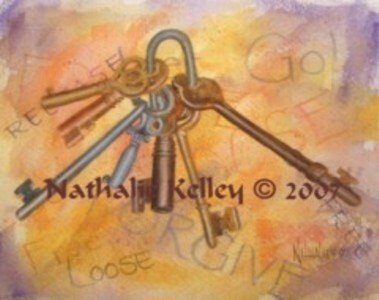 In this painting, the small keys could be for the little offenses, the old key is wounds from our past, and the long slender keys to reach those areas way back in the back of our heart or mind. When praying the Lord’s Prayer we say, “Father, forgive us as we forgive those who have sinned against us.” Do we really want God to forgive us as we forgive others?